Don’t go to “Mount Vernon expecting to be entertained. It's just a house. The excitement comes from treading in places where history was made." It is ideal to take "the time to sit in the seats on the veranda to relax and take in the sites and settings" because "Mt. Vernon is not a rush to fit-it-all-in place, but one for strolling, observation, and contemplation." Buy your tickets online to get a discount on general admission tickets, skip the long lines at the ticketing booth and to be able to select a tour time for the Mansion Tour. Buy a timed admission ticket for the first tour of the day. (Caron Chapman-Case) See the next section for which tour you should take. They also have the special tours at the end of the day that are well worth it. But they fill up fast, so be sure to sign up well in advance. Download the Mount Vernon app for iPhone or Android. With it you can listen to descriptions while you tour without renting a recording device. It includes a Plant Finder and much more. Go on a dry day since there are many dirt trails that could get muddy. Wear comfortable shoes and wear sunblock as some areas are not shaded. Bags should be no larger than 16 x 16 x 8 inches. Be prepared to walk a lot and bring water as it can get hot on the trek. Although there is a courtesy shuttle that will take you around the estate from April to October. If you are visiting during a peak period, arrive after 1 pm on Tuesday, Wednesday, or Thursday. Best months to visit: January to February and September to October. Less crowded, and usually pleasant weather. There are different views on whether coming in the morning is a good idea, especially when school is in session, tour groups come through every single day of the week. Visiting during the summer are less chaotic. A general admission ticket gives you access to the famous mansion, the beautiful view across the Potomac River, all the surrounding colonial buildings, Washington's amazing gardens, the tombs, the farm, and the museum filled with Washington treasures. Free showings of several Mount Vernon films are included in the general admission ticket and takes place daily in Robert H. & Clarice Smith Auditorium, in the Ford Orientation Center and in the Museum and Education Center. The estate has moved to a timed ticketing system for the Mansion, so visitors can better spend their time exploring the grounds and not waiting in line. Depending on the number of guests each day, the tour can last between 15 to 35 minutes. Everyday, a brief wreath-laying ceremony takes place at the Washingtons' Tomb. Take the National Treasure Tour which takes you through the basement of the home and down to the waterfront. Experience Mount Vernon from a different perspective on a Sightseeing Cruise of the Potomac. If you don't have a car, go on a weekday when the Fairfax Connector buses run more frequently. Only take the 101 bus, travel time is around 30 minutes from Huntington metro. No outside foods or drinks are allowed, except for water. Food may be purchased at the Food Court Pavilion or at the Mount Vernon Inn Restaurant. It's possible to visit his Gristmill and Distillery which is open from April to October, by riding the shuttle as it's only a few miles away. Make sure to visit the House for Families and all of the buildings surrounding the mansion like the blacksmith, etc. Walk the gardens, view the Potomac from the veranda, and visit the museum. (Jenny Lynn) All of these are included in the general admission ticket. Go ahead and enjoy the restaurant. They serve colonial-era recipes, such as George's favorite breakfast cakes. Don't miss the gift shop either as it has great things to purchase that aren't your typical cheap items. They have a great selection of wine from their vineyard. Take the kids to the farm area and allow them to interact with the live animals many of which are the same breeds raised in Washington’s time, including Ossabaw Island Hogs, Hog Island Sheep, Dominique Chickens, and Red Devon Cattle. Mount Vernon is also home to horses, mules, and oxen. Mt. Vernon has a new app, Agent 711: Revolutionary Spy Adventure, where kids can become a spy for Gen. Washington and can go undercover to test their spycraft skills as they explore the grounds of Mt. Vernon. Make time for the Hands-on-History Center where kids can dress up in 18th century clothing, play with the Mt. Vernon dollhouse, play 18th century games, puppets, and puzzles. In the Museum and Education Center, head over to the Revolutionary War Theater to watch the 4D movie, General Washington, Commander in Chief. This is a 20-minute immersive experience with smoke, fog, snow and vibrating seats! If you’re short on time, head there first to get in line and watch the film, then spend the remainder of your time visiting the exhibits. Other highlights of the museum include George Washington's false teeth, wax figures of George at different ages and many interactive exhibits. The Mansion of George Washington's Mount Vernon is one of the most iconic 18th-century homes in America. George Washington’s beloved Mount Vernon began as a one and one-half story farmhouse built in 1735 by his father, Augustine, and received its well-known name during the ownership of his half-brother Lawrence. George acquired Mount Vernon in 1754, and over the next 45 years slowly enlarged the dwelling to create the resplendent 21-room residence we see today. Washington personally supervised each renovation; advising on design, construction and decoration—even during the Revolutionary War. 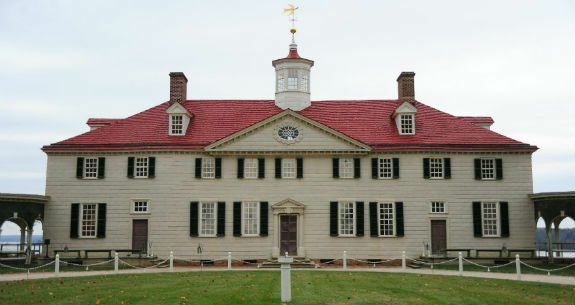 Conscious that the world was watching, Washington selected architectural features that expressed his growing status as a Virginia gentleman planter and ultimately as the leader of a fledgling democratic nation.